Won for Best Cinematography; Best Art Direction-Set Decoration. Nominated for Best Picture; Best Director; Best Actor-Paul Newman; Best Actress-Piper Laurie; Best Supporting Actor-Jackie Gleason, George C. Scott; Best Screenplay. Some will claim I’m still an idiot, but this discussions proves that I was even more of a moron 15 years ago. I rewatched Money a few years back and felt quite disappointed by it. Essentially, Martin Scorsese created a two-hour beer commercial that lacked any real connection to the original film. The Eighties Eddie Felson bore no resemblance whatsoever to the Sixties one, other than the fact both looked a lot like Paul Newman. Anti-heroes weren’t allowed in mid-Eighties Reagan-era America, so everything was sunny and shallow. The Hustler isn’t that kind of film, and thank God it doesn’t take the easy path. 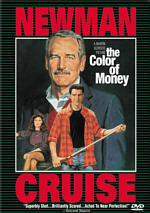 The Color of Money tried to remake Hustler as a happy flick. That defeats the whole purpose, really. It’s like having Ilsa miss the plane, or keeping Rhett with Scarlet - some movies work best when they don’t give the audience the easy out, and The Hustler falls into that category. I felt pleased that director Robert Rossen avoided the easy way out during The Hustler. Not only did he skip the peppy and happy ending, but he also told the tale in a way I’m not sure a studio would allow these days. 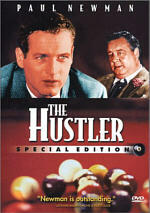 For example, the first 36 or so minute of The Hustler provide exposition that takes place in pool halls! The initial battle between Felson and Fats goes on much longer than I’d expect, and I seriously doubt many directors would now be willing or able to devote so much time to that endeavor. It’s crucial, however, and not a moment of it seems wasted. The Hustler appears in an aspect ratio of approximately 2.35:1 on this single-sided, dual-layered DVD; the image has been enhanced for 16X9 televisions. A few problems kept the picture from greatness, but overall I found the image to appear almost shockingly excellent. Sharpness seemed virtually immaculate. Throughout the film, the picture remained precise and rock-solid. The only noticeable examples of mild softness occurred during the credits, as the shots lost a little tightness due to the superimposed text. Otherwise, the movie came across as crisp and detailed. Moiré effects and jagged edges presented no concerns, and print flaws seemed extremely minor. Some light edge enhancement marred the image at times, and I saw a few examples of speckles and grit. However, the various defects seemed exceedingly minor given the age of the film; this was a very clean print. Black levels came across as terrific as well. They appeared nicely deep and rich throughout the movie, and contrast was absolutely perfect. The DVD provided a very satisfying black and white tone that showed no faltering. Shadow detail looked clear and appropriately opaque, with no issues related to excessive darkness. I badly wanted to give The Hustler an “A” grade, for it looked so amazing, especially given its age. However, I regard edge enhancement as a major problem. Even though The Hustler didn’t suffer from much of that concern, it still appeared significant enough for me to lower my grade to a “B+”. Despite that, this remained a stunning transfer. Unfortunately, the stereo soundtrack didn’t live up to the high standards set by the picture. Some studios do good multichannel remixes of monaural source material, but Fox doesn’t seem to get it. I disliked the stereo tracks heard on the recent Marilyn Monroe “Diamond Collection 2” releases and also found problems within the remix of The Hustler. The soundfield itself wasn’t an issue. For the most part, it offered broad mono. The audio spread modestly to the side channels but remained fairly heavily anchored in the center. A few scenes worked better than others did; for example, a rainstorm demonstrated moderate breadth across the front. However, overall this remained a pretty centered track. That didn’t bother me, but the method in which the audio has been altered did cause concerns. As also marred many of the Monroe tracks, the sound of the stereo mix displayed an excessive sense of reverb. Everything gets a layer of echo that made the whole track sound artificial. Happily, however, the DVD also included the original monaural mix, which offered a much more satisfying experience. It didn’t seem like a stellar piece of work, but the audio sounded good for its era. Speech was reasonably natural and distinct, and I heard no problems related to edginess or intelligibility. Music seemed clear and acceptably bright, while effects were clean and accurate. The track lacked much depth, but it still remained adequate for the period. I heard a little background noise at times, but this never became a distraction. It’s my policy to only formally grade the “most multichannel” mix on a DVD, which is why The Hustler got a “C-“ above. However, the mono track earned a solid “B-“ and is the one to play. For this special edition release of The Hustler, we find a moderate collection of extras. Most significant is an audio commentary that features a variety of participants. We hear from actors Paul Newman and Stefan Gierasch, Carol Rossen (daughter of director Robert Rossen), editor Dede Allen, assistant director Ulu Grosbard, Time Magazine critic Richard Schickel, and film historian Jeff Young. Hosted by Stuart Galbraith, this edited program uses an interview format that makes it unusual. Galbraith asks the questions, which we hear; many commentaries feature interviewers, but few become audible during the track. I know some folks don’t like this kind of commentary, but I enjoy them, and the piece for The Hustler worked very well. One warning, however: the track often digresses onto topics not directly about the film. In particular, we learn a lot about the career of director Rossen and his involvement in the “red scare” of the era. No mention of this appears anywhere else on the DVD, so these elements become particularly compelling. Otherwise, we learn some good notes about the movie and other elements, as the commentary offers an entertaining and well-developed piece. After this we get some video extras. The Hustler: The Inside Story provides a new featurette about the film. It lasts 24 minutes and 30 seconds as it combines scenes from the film, production and behind the scenes stills, some newsreel footage and new interviews. In the latter category, we hear from Carol Rossen, Richard Schickel, Ulu Grosbard, world artistic pool champion Mike Massey, actor Jerry Orbach, pocket billiards historian Charles J. Ursitti, and Stanley Cohen, author of Willie’s Game. Although How to Make the Shot and Trick Shot Analysis By World Champion Trick Shot Artist Mike Massey appear to be two different pieces, they really offer different ways to access the same footage. Go with the latter route and video pops up during the movie, while the former method lets you watch the material on its own. We get a small Behind the Scenes Gallery as well. This includes a whopping nine photos that mix production stills, candid shots from the set, and advertisements. 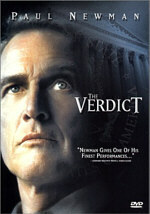 The DVD also provides trailers for a number of Newman flicks. We find both the US and Spanish-subtitled theatrical trailers for The Hustler as well as clips for Butch Cassidy and the Sundance Kid, Hombre and The Verdict. Lastly, The Hustler features the THX Optimizer. Also found on many other DVDs, this purports to help you set up your system for the best reproduction of both picture and sound, ala stand-alone programs such as Video Essentials. I’ve never tried the Optimizer since I’m happy with my settings, but if you don’t own something such as Essentials, the Optimizer may help you improve picture and audio quality. Despite my much-earlier dislike for The Hustler, I now find it to offer a pretty terrific piece of work. Buoyed by some daring storytelling and excellent acting, the film holds up well after four decades. The DVD offers surprisingly strong picture quality along with erratic sound. The stereo mix is a mess, but the original monaural track works fine. In addition, the disc provides a smattering of good extras. 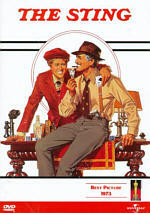 With a low list price of $19.98, The Hustler comes strongly recommended.